Sea Turtles and Hilton Head Island! While we wait for the final 3 nests to hatch and be inventoried, just a quick word of thanks to you – our amazing nest adopters! 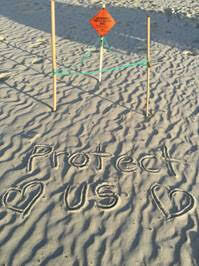 We cannot say enough about the actions and support for the sea turtles that we have seen from our army of adopters. From 44 states and 5 countries, you have been spreading the word, sharing your enthusiasm, and taking action for the preservation of the special endangered creatures that nest on the Hilton Head Island beaches. You are awesome! Many classrooms around the country, including our local elementary school, have raised money to adopt nests so teachers can help their students understand the plight of endangered species. 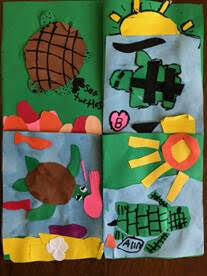 (Many parents and grandparents also adopt for their children’s or grandchildren’s class – very cool gift!) Thank you! Speaking of helping the sea turtles, two couples who are adopters, followed the lead of other local neighborhoods, and started an evening patrol group this summer to make the north end of the island free of holes and trash so the sea turtles could nest and hatch. 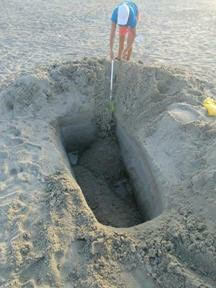 The North End Sea Turtle (NEST) Trackers are cleaning up the beach and helping educate our locals and tourists alike. Thank you, Lisa and Don, and Chris and Cindy! Robbie Bunting and Jane Hyers of Hilton Head Properties Realty and Rentals who adopt a nest for each of their clients. Fantastic introduction to the island! And we are so grateful to the law firm Winston and Strawn who spread the HHI sea turtle word to their staff in New York, Illinois, Texas and California offices. Yeah, Allan!! We put together this Itinerary for the Hilton Head vacationer that loves to take day trips. Hilton Head Island, SC is in the geographic center of some significant historic towns including Beaufort, Charleston and Savannah. As well there are some out of the way places that are fun for day trips from Hilton Head. We hope this gives you some ideas! Hilton Head Island is one of the top tennis destinations in the world. Boasting over 500 tennis courts and eight of the top 100 tennis resorts, Hilton Head Tennis is hard to beat. Our vacation itinerary is centered around the tennis and clinics offered on Hilton Head. Are you a Beach-Nut? Hilton Head Island has several beaches to enjoy during your vacation. If you like to explore, we have listed a different day of the week for a different beach. We hope you have some fun in the Sun with our The Beach-Nut Itinerary! Looking for a fun filled week on Hilton Head Island? “The Kingfisher” offers day trips to Savannah by boat, a carriage ride in Historic Beaufort and Fireworks in Shelter Cove. This itinerary was designed to fit perfectly with one of our big vacation homes or we can scale it back for a Sea Cloisters, Ocean Palms or one of our other properties! Is your Hilton Head Property ready for the New Year? Looking to buy, sell or rent a Hilton Head Property this year? Check out our services! We dodged a bullet on Hilton Hilton Head Island with Hurricane Mathew! Working together it is is amazing how much we have accomplished in such a short time. While we are picking up and mending our homes, many of our vacation properties and resorts will welcome you back once again. If you need an update on your property, a repair made or want to find out more about what’s happening in the Hilton Head area, please let us know. If you need work done on your Hilton Head property, we have a long list of vetted contractors and service providers that we would be happy to share. We are hearing outrageous quotes for tree removal and deposits being made and workers not showing up. Our contractors are local and you can call on them now or in the future. We can also have them check the condition of your property. Keep in mind, even vacant lots should be checked for leaning trees. Many of the communities on Hilton Head Island have been posting updates on their community websites. These communities include: Sea Pines, Palmetto Dunes , Shipyard, Hilton Head Plantation, Long Cove, and Port Royal. As well, openings around the Hilton Head area include: Golf Course Openings, Fall Specials, Parks Reopened, and Vacationers Return. Please check our facebook page for these daily updates. Surprising enough, we have been busy this week showing property and writing contracts on Hilton Head Properties. The good news is that the Hurricane did not slow down our buyers. We can’t wait to show you our awesome properties this fall! Our rental company and crew did a fabulous job securing our vacation properties before and after the storm. They are busy again helping guests book great vacation rentals. The fall weather is wonderful and we hope you can make time to enjoy a long weekend or upcoming holiday with us.